Most people devote much time researching and investigating important issues before making a decision or reaching a conclusion. 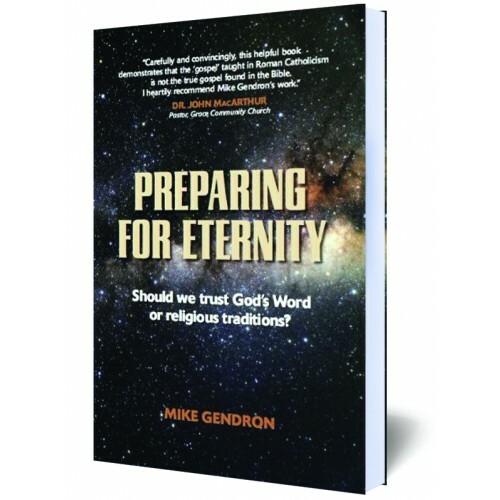 Yet when faced with the most important issue of their earthly life, “where will I spend eternity?”, they appear to be unconcerned or disinterested. Since God does not promise anyone tomorrow and man’s eternal destiny is sealed at death, would it not be wise to investigate these things? This book helps you do just that by contrasting the truth of God’s Word with the teachings and traditions of the Roman Catholic Church. This new book will equip and encourage Christians to proclaim the glorious Gospel of grace to Catholics and also persuade Roman Catholics to trust the Word of God over the teachings and traditions of their church. The book is rich with Scripture and begins by laying a biblical foundation for truth and authority. It pleads with Catholics to work out their salvation with fear and trembling by examining the biblical requirements for salvation, how sins are forgiven and how they can know eternal life is secured by God. After years of experience in witnessing to Catholics, author Mike Gendron answers over 100 commonly asked questions by Catholics. Each question is answered with the power and confidence of God’s word. Any Catholic who is earnestly seeking the truth will welcome a copy of this book.